What are amazing predictive dialer features of your call center system? A predictive dialer is very important when you have to handle multiple calls without the fear of dropping a call. Predictive dialer is an integral part of a call center. This kind of software is also known as an automated dialing system. Call center and telemarketers uses this software to lessen the pressure of dialing multiple numbers manually. This automated dialing system is specially designed to connect the call when a live person responds to the call. As soon as the connection turns live it is forwarded to a live operator. Predictive dialer features include the prediction of each call. The dialer chooses from the list of client’s number and dial calls automatically on the completion of the former. Your targeted client will get connected when he will receive the call. The system never misses any numbers. If a call is not answered then the automated dialing system switches over to another number in the order of numbers. The process is quick and saves a considerable amount of time. Managerial functions are also one of the great predictive dialer features. It is very helpful in making reports. It can collect a report and can even import or export one. In fact, you can also get reports on call codes, calling schedules, leads and call reminders. This makes the automated dialing system a resourceful and successful manager’s tool. Call center calling software also has the generation and control of leads. It manages the lead in a quick and efficient style. It also helps you in remembering your data by reminding you to hit the targeted amount of sales by maintaining a record of your work. The predictive dialer features also offer the performance appraisal of your work. The predictive dialer features also include the calculation of the timing of each call with the help of special algorithms. It maintains the record of the amount of time essential to switch a single call. Automated dialing system also monitors the quality of conversations as they record the calls. The talents and capabilities of the agents are exposed to this software. Above were some of the amazing predictive dialer features that automated dialing system offers. Now you can easily invest in a predictive dialer system. Customer satisfaction is the ultimate goal of any organization and you need to work on it. Our predictive dialer providers will help you in the achievement of your determined goals. Contact us to know in detail!!! November 1, 2017, the global river giant Viking cruise ship in Loushanguan Road, the naked heart of the Chinese office celebrations officially opened. The Viking cruise ship’s personalized office building is intended to expand the Chinese market. At the same time, the personalized office needs reasonable management to realize, which is inseparable from the excellent enterprise management system. With its perfect management system and unique customization, astercc has the honor to be the first choice of the service management system of Viking cruises. Since the establishment of Salesforce in 1999, the global for 15 m companies are using salesforce powerful features to share customer information, Astercc has been systematically optimized several times,so that you can seamlessly dock with the salesforce system inside the Viking ship and make it easier and faster to use. What’s more , which about Viking cruise ship choose ASTERCC another important reason is ASTERCC can afford Tailor-made agency function for him. The astercc aims to achieve more transparent and convenient management of the agency according to customers’ requirements, and in the original basic call system specifically for its customized agency details and agency group detail function, which Can check the work situation of the agency in half an hour. The seating group customization include about Inbound call,2s Abandon rate amount, the work of agency, Average waiting time, Average Talk Time, Abandon Rate, and the response rate of response in 20s. In addition to the above functions, the seating record is more specific to the accurate calculation of utilization. The calculation excludes loginlong, the busy lunch time, the busy time of the meeting and the length of the training. Productivity, loginlong, average ringing time, the average response speed, the length of the call, the length of the post, the average call processing time, and so on, which can make the management of the seat is more simplified and efficient.the rate of the service of the agent is improved greatly, so that the service management is maintained and the benefit of the enterprise is maximized. ASTERCC the cooperation with the Viking cruise ship, not only the strong combination for the Viking cruise ship to bring a smooth development, but also for its high-speed development of the Chinese market to provide a more intimate service guarantee. new parameter ivrinputcode in astercc.conf, when it has a value, system only save correct input code(transferred) in CDR. As a leading mobile commerce application developer, Shen Zhen Huo Li Tian Hui Technology Co., Ltd. to more than 50 million business travelers to provide one-stop travel search and services, won the majority of business users favorite. As the product is in urgent need of build of customer service center function, Shen Zhen Huo Li Tian Hui Technology Co., Ltd. 2016 at the end of active contact and start cooperation with Sonicwell. To provide users with fast consulting business is the purpose of the construction of the call center, its business distribution to Shenzhen, Wuhan and Beijing, the scope of application covers flight steward, high-speed rail housekeeper, fast hotel housekeeper. As a business application to provide business consulting business expansion, asterCC system on the customer service center efficient management and office has important significance, the formation of customer service center for customers to use mobile commerce applications to facilitate the same time, greatly promoted the service industry information And profitability. As one of the most influential mobile Internet company in China, Shen Zhen Huo Li Tian Hui is committed to product design and service of mobile phone software development, business services, mobile community, LBS, mobile e-commerce field, deep plowing 10 years of Internet and mobile communication Server-side carrier-class product development, as a professional mobile application development and operations, Shen Zhen Huo Li Tian Hui of the Department of Science and Technology Co., Ltd. technical team and asterCC contact test system, call center based on asterCC system based on the basic call customer service function. Configuring the Active / Standby asterCC server improves the high availability of the system’s operating environment. Seat use asterCC comes with the CRM system, call configuration full recording function, work order module function to improve the efficiency of the internal work exchange agent. A work order is used for incoming customer service to create a business request submitted by a customer or an internal employee. A work order is like a tracker, can be very clear to track, deal with and archive internal and external issues of business requests. With standardized management, a clear service support process, cross-agent, cross-agent group collaboration to enhance the quality of customer support services to customers, the efficiency of the office, and then enhance the professional image of the enterprise. 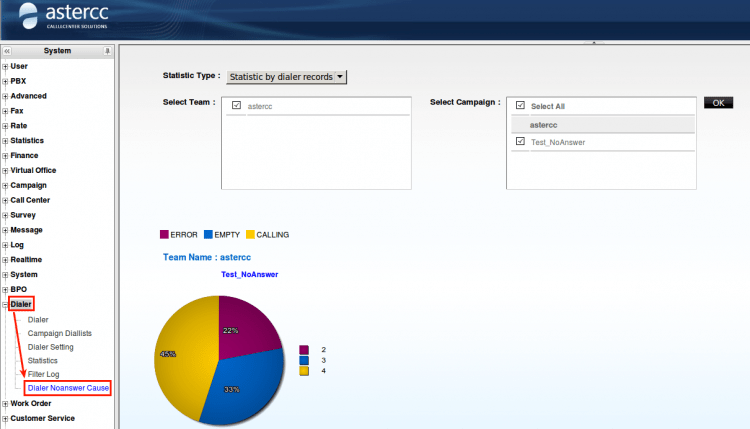 Report statistics and IVR agent scoring system with the use of help agents quickly grasp the seat of the working state. The schedule reminder helps the agent to build an orderly and efficient work environment. The ease of use of the system allows the administrator to manage the user management and business management directly to the subordinate business team, the liberation of manpower to make the administrator can focus more on the system maintenance and improve work efficiency. Since the establishment of a cooperative relationship and put into use, asterCC call system performance has won the management and service personnel affirmed. The operations team has cooperated with asterCC technical staff on the system-specific customization function, so that the statistical report function is fully qualified for a variety of consulting business needs, through the joint efforts of both sides to establish a long-term stable cooperative relations. Customer advice, complaints, inbound are one of the important businesses that many companies after sales. Pang Da Qi Mao Group Co., Ltd is a company like this in china. And the domestic leading converged communications products and program providers Sonicwell cooperation, based on the cloud platform set up 4S shop cloud call center system, support the 4S shop customer advice complaints and call investigation call business system. Customer consultation complaints and outreach Research are important business components of the Pang Da Qi Mao Group Co., Ltd. Customers in the purchase of automotive products at the same time, often need better after sales service. With the rapid development of communication technology, telephone consultation has become an important carrier to strengthen communication with customers. Proper and efficient communication with customers to accept customers ‘opinions on products and services is a key to win customers’ high satisfaction and profitability. The AsterCC call center system make complex consulting and statistical business has become simple, simple telephone consulting business has become more abundant, for customers to buy products and after sales service to provide a convenient. “Efficient: here refers to every people at work, to do every job to the best, to make high efficiency, high income. “This corporate culture for the Pang Da Qi Mao Group Co., Ltd. won a large number of customers, by seeking cooperation with asterCC through long practice, call center system This idea. Based on the concept of high efficiency, the Pang Da Qi Mao Group Co., Ltd. made the following requirements: Based on the China Xiang Yun cloud platform equipped with asterCC system set up a cloud call center, customer service using Yealink SIP phone, to achieve 24 hours a day to provide a perfect platform for customer service , Call customer service function and questionnaire function. Simple interface easy to operate, to provide simple and convenient of statistical features. So this system is able to make customer service staff clear tasks, easy to use, improve efficiency. Long term cooperation and use, making a Pang Da Qi Mao Group Co., Ltd. asterCC call center products to win trust, but also based on the latter in the industry has made achievements and influence, Making asterCC call center solution a wider range of applications. AsterCC call center can‘t be limited by geographical and business development, Pang Da Qi Mao Group Co., Ltd. is attracted by asterCC CRM, the agent mode work page with the questionnaire is simple and efficient. At the same time asterCC call center products powerful report statistical function is to win the praise, to facilitate business management to keep abreast of customer service conditions, and for the strategic planning of enterprises play a necessary support. astercc provides 60 days 5 agents free trial, you can download from here. * The QC Rate is not limited from 1 to 5 any more. * Add the “Yesterday” quick button on the Agent Details page. * Add the function which shell exporting for IVR Details. * Add the Regional Report page under statistics modules. * To avoid misunderstanding，the “OK” button changes to “Save Auto Assign Plan” button on the assigning page under Campaigns module. * The default distribution style of customers assgining is “by all noassign”. * The SMS server can be set up by Team. * Add function which hugup the ringing agents when there’s no idle agent in queue.There is the function switch under [Campaign]->[Campaign Management]->[Predictive Dialer]->[Hangup Ring When No Idle]. * Under the device model，the retrieval time of call-parking modified from 12 seconds to 300 seconds. * Add the Agent Group field on [Customer Service]->[Missed Calls] page. * The system will stop the manually dialing if there are erroneous dialing. Add a Continue Dialing button when submit duplicate applications for dial-out.It could remove the data has been dialed before，and insert a new dialing request. * Add the Select All checkbox function，under [Message]->[Notices]->[Add] directory，you can select all recipients. * The format of Contact’s Hiding. Now it will be hidden 5th-8th digits from right, if it less than 5, hide all the numbers. * Repaired the bug which failure of recording generation when the Rec Condition is “All” and use the device model. * Repaired the bug that can’t saved the Role twice after you don’t select the required content first on [User]->[Roles]->[Add] page. * Repaired the limit of Device Detail length on [PBX]->[Devices] page. * Repaired the bug that can’t edit again after saved when CIDNum has several NULL on [PBX]->[Trunks] page. * Repaired the fields are vary with export format(.csv or .xls) on the [CDRs] page. * Repaired the bug if you download the image or PDF， it will popup “select agent group” although you have selected the agents and “All Group Accumulation” on the [Agent Graph] page. * Repaired the bug that will delete other all datas of campaign used Main table, when you delete the datas after searching by “Updated” field on [Campaign]->[Customers] page. * Repaired the exporting bug that it can’t download the file when there are several blanks in exporting file name. * Repaired the fields lack in export file on [Call Events]. * Repaired the default privilige bug of Role type is “Account”, the dialer’s page selected default, it should be controled by Roles. * Repaired the bug that it can’t recycle the data immediately via setting “Schedule” time to 0000-00-00 00:00 on [Dialer]->[Dialer]->[Recycle] page. * Repaired the bug when you export the datas by .csv format on [Customer Service]->[CDR]. * Repaired the bug that the Storage Management module can’t be deleted along with uninstallation of E-Commerce module. * If the Name of customer contact information is NULL. The label name will quote the first field in [Campaign]->[Campaigns]->[Basic]->[Agent Fields]. Repaired the bug that not hide the phone number although set the “Hiding contact info.” to “Yes” when set phone1 to the first field in [Agent Fields]. 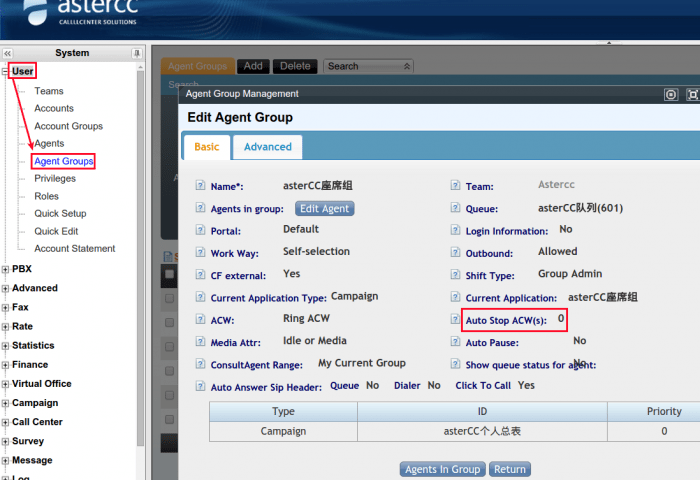 * Repaired the bug that accounts can’t be listed after selected account group by administrator on [Message]->[Notices]->[Add] page of agent work interface. * On [Dialer]->[Dialer Noanswer Cause] page，repaired the bug that can’t find the campaigns under current team when “Purview” is “Team” on [User]->[Roles]->[Privileges Setting]->[Dialer]->[Dialer Noanswer Cause]. * Repaired the display bug that when using the IE(version 8 9 10) browser，it always displayed “NAN” on status label. * Modify the automatic dialing countdown always start from 60 seconds after every pause. * Repaired the memory overflow problem of http push module. * Fixed the bug that timing file task can’t be synthesised in time. * Repaired the bug that missing of Customer Service when we initial the demo of asterCC system. We are proud to announce that we released new asterCC, in this version we added one cool feature, you could get a report about why your calls are now answered, like busy, invalid number, defaulting subscriber etc, based on early media, we could generate a no answer report for each campaign: for full change log, please check here You can download the system to have 60 days 5 agents trial with all features.